Our valuable customers the Boise, Eagle, and Meridian ID area can now get state-of-the-art dental technology treatments using the CT scanner and 3D digital x-rays. 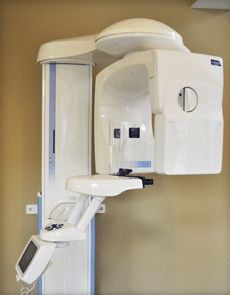 We use Cone Beam 3D imaging to measure the quantity and quality of bone for dental procedures. Cone Beam 3D Imaging combines low dose radiation patient exposure (up to 15 times lower than conventional CT scanner), with high quality 3D diagnostic imaging. Radiation doses can be automatically adjusted according to patient size and age. 3D Cone Beam imaging is fast, simple and totally painless. It only takes between 10 and 70 seconds to complete the scan and provide the dentist with computer generated views of the bones of the face, the teeth and many other details from any angle, in 3D and in color. Cone beam 3D imaging provides the most accurate and complete information possible in the fastest amount of time so we can accurately plan your treatment. It is especially useful for cosmetic and reconstructive dental work. We can perform ConeBeam Imaging in the Boise office at a lower cost than we can offer CAT scans or MRI imaging. An added benefit is that the scan images can be placed on a CD and sent to a specialist if required saving the patient future scans and x-rays. How Does Cone Beam CT Scanner Work? The 3D Cone Beam imaging system is really a digital x-ray scanner that is mounted on a rotating arm. It’s referred to as a “ConeBeam” because the scanner projects digital x-rays in a carefully controlled, cone shaped beam. The patient sits in a chair while the scanner moves in one complete circle around your head, gathering all of the scan data it needs. Once the scan is completed our Boise dentist or specialist can request any views they need on a computer monitor. They can see 2D, 3D and panoramic views of your entire mouth. The imager provides different angles and magnifications. It even allows us to see the relationships between bones, teeth, airways, nerves and tissues so we can plan out an accurate treatment plan. With the level of detail provided with the Cone Beam CT scanner it is quick and easy for dentists to evaluate if the patients has enough bone to support the dental implant, or if a bone graft is necessary prior to beginning dental implant procedures. The CT scanner also makes it easy to determine if a tooth, gums or other tissue is infected and allows for accurate treatment planning. 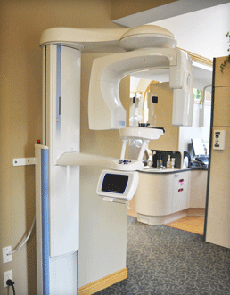 We use the high-tech Cone Beam CT scanner for many dental procedures. It allows early detection of dental diseases and oral cancer and provides accurate information increasing the likelihood of highly successful dental procedures that keep you smiling broadly and brightly.